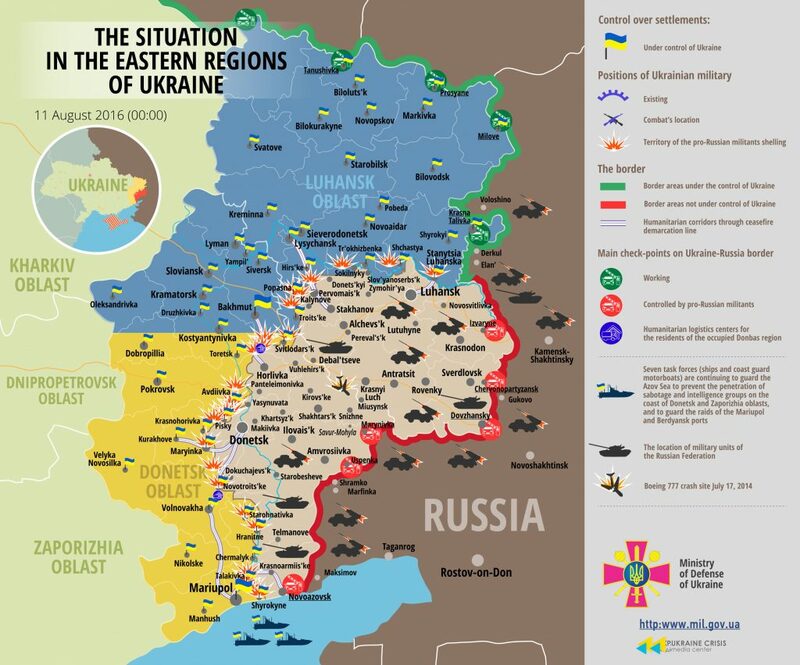 Militants violate the ceasefire 12, 23 and 32 times in the Luhansk, Donetsk and Mariupol sectors correspondingly. Two children were injured in Mariinka as a result of militants’ shelling, and Russia continues reinforcing Russian occupational forces. Kyiv, August 11, 2016. Ukraine has not committed any armed provocations on the administrative border with Crimea and no officers of the Main Intelligence Directorate of the Ministry of Defense of Ukraine have been detained in the temporarily occupied Crimea. “The Russian Federation made another step in the informational warfare. The Federal Security Service of Russia and Putin accused Ukraine of instigating provocations on the administrative border between the Kherson region and the occupied Crimea and came up with a series of threats towards our country. All of Moscow’s statements made yesterday contradict reality. […] These Kremlin’s actions and statements were made in order to discredit Ukraine, undermine the Minsk Agreements, and escalate the conflict in the east of Ukraine caused by the Russian aggression,” said the spokesman of Presidential Administration on ATO-related issues Colonel Oleksandr Motuzyanyk. The President of Ukraine, Petro Poroshenko, emphasized that it is Russia that “has been generously financing and actively supporting terrorism on the territory of Ukraine, bringing it to the level of its state policy.” “Our partners from the United States of America discarded these false allegations of Russian authorities. For instance, the US State Department and Geoffrey Pyatt, the United States Ambassador to Ukraine, emphasized that there was no proof to back these Russian allegations, as Ukraine refuted them. We call upon citizens to stay alert,” added the spokesman. Militants violated the ceasefire 12 times in Luhansk, 23 times in Donetsk, and 32 times in Mariupol sectors in the ATO zone yesterday. One Ukrainian serviceman died in combat and four were wounded. Tensions stay high in the Luhansk sector in the vicinity of Popasna, Bakhmut road and Stanytsia Luhanska. “The enemy opens fire during the hours of darkness using small arms and grenade launchers. Mortar launchers were used in Krymske and Stanytsia Luhanska yesterday,” said Col. Motuzyanyk. Militants’ combat activity resumed near the Donetsk airport in the Donetsk sector. Russia-backed militants instigated a provocation involving the use of grenade launchers near Pisky in the afternoon. Insurgents shelled Ukrainian positions in Opytne from artillery and large machine guns late at night. Russian proxies started the day with mortar attacks in Avdiivka and finished the day with the same. In addition to mortar launchers, militants were shooting from grenade launchers of various systems and small arms. The armistice held in the Avdiivka industrial area during the day. “The Svitlodarsk bulge and the northern outskirts of Horlivka were yet more areas where militants were active. In total, 23 hostile attacks took place in the Donetsk sector yesterday, with more than half of them involving the use of heavy armor,” added the spokesman. It was the first time in the last two weeks in the Mariupol sector that militants were not shooting in Krasnohorivka and focused their combat activity on the adjacent Mariinka. Russian proxies started shelling Ukrainian positions with grenade launchers and small arms around 6 p.m., following which they drove in the armor and opened from armored personnel carriers and infantry combat vehicles. “Attacks stopped late at night. Two children – an eight-year-old and a 13-year-old – were injured in Mariinka as a result of hostile combat activity. Moreover, three residential buildings were damaged in this town in the occupants’ aggressive actions,” said Col. Motuzyanyk. Militants also were active in Novotroitske and Hnutove-Shyrokyne frontline area in the Mariupol sector. Attacks were mostly conducted during the hours of darkness in this area. “Adversaries launched over 60 mortar shells at Talakivka defenders’ positions. At the same time, enemy delivered an intense artillery attack at ATO troops’ positions in Vodiane at dawn, launching 70 122-mm missiles. Moreover, the enemy was conducting mortar attack at our positions in Shyrokyne for 60 minutes at night. In total, 32 hostile attacks took place in the Mariupol sector, and six of them involved use of heavy armor,” informed Col. Motuzyanyk. According to the updated information, five militants died on August 8-9 and 16 more were injured. So-called “1st” and “100th” brigade, “9th” and “11th” regiments of Russian occupational forces incurred losses. Militants organized three flights of unmanned aerial vehicles yesterday, all of them in the Mariupol sector. According to the Main Intelligence Directorate of the Ministry of Defense of Ukraine, rotation of a subdivision of the 331st parachute regiment of the 98th division of Airborne Forces of the Russian Federation (home base – Kostroma) took place on the temporarily occupied territories. This militant subdivision is fighting in Avdiivka-Mariinka frontline area. Military intelligence informs that another batch of reinforcements arrived for militants from Russia. Three self-propelled artillery mounts “Gvozdika”, three self-propelled artillery mounts “Akatsia” and five trucks with artillery ammunition were transported through Diakove towards Debaltseve using low-bed trucks. Following the unloading of the equipment, the trucks returned to the territory of the Russian Federation.